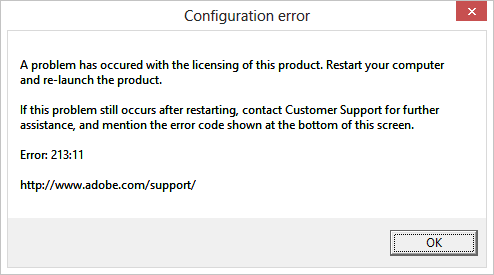 "Error 213:11" when attempting to launch Premiere Pro CS6 as a non-administrator; application launches once, presents pop-up error, then exits. Subsequent launches display the pop-up message only. While this might be enough to make Premiere work, some Adobe community members reported that the Encore component will not write to a dual layer DVD without administrator access regardless. Saving DVD images to .ISO or similar files and using an alternate image writing utility may work around Encore's limitation. WARNING: These steps will expose the listed folders to potential misuse by non-administrators.